Follow up to my Observer article on Pandora. The New Rules of Social Journalism. 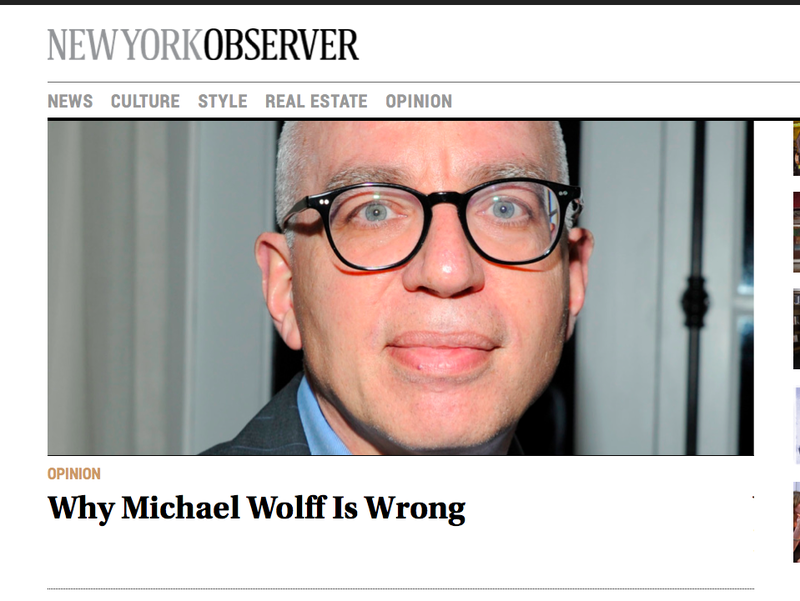 I’m pleased http://observer.com/2014/03/why-michael-wolff-is-wrong/ is getting a good response in some quarters. Romenesko.com also included the column in their roundup. And I’ve been invited in to talk to execs at a couple traditional media brands, which is encouraging. 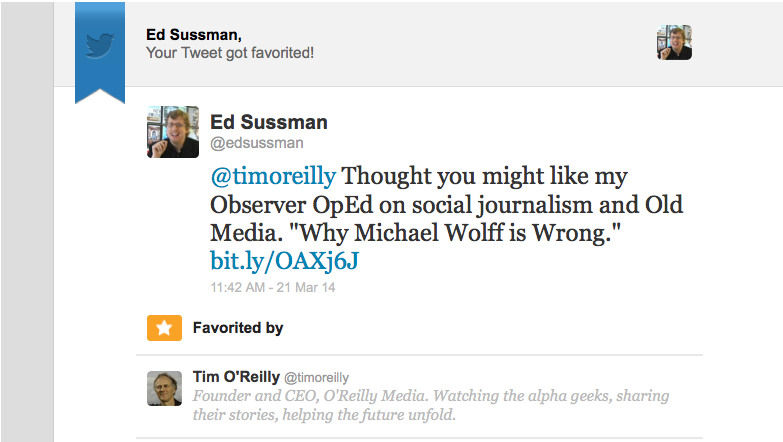 Google responded by placing my Quora “About Ed” page on the first page of “Ed Sussman” search results. Then, for reasons I don’t understand, Quora dropped to page two, then disappeared entirely. Not anywhere. Even when I search the exact URL on Google, it doesn’t show up. The “About” page has been banished from search. I’ve broken some invisible Google rule. The only thing that occurs to me is that when Slate re-ran the popular Times answer on their site, Google punished the repetition. 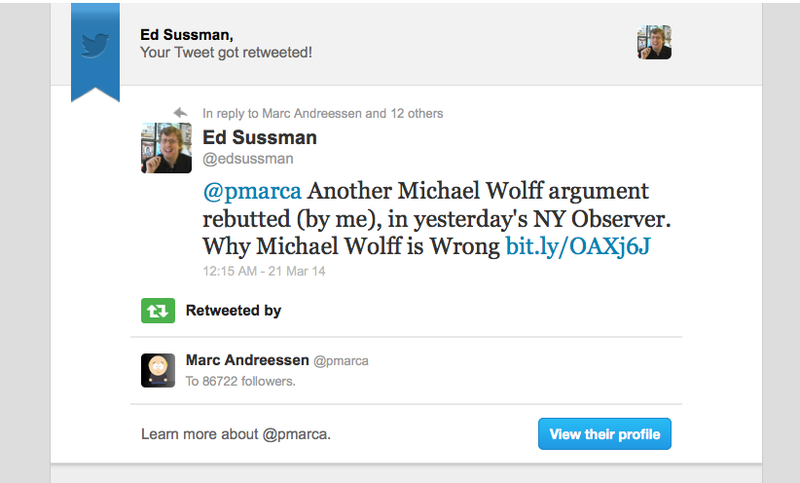 In any case, here’s the link – maybe it will re-appear on day. I’m getting more accustomed to the Blogger interface. Still incredibly limited compared to WordPress (let alone Buzzr.com) but OK for simple blogging, particularly mobile app. 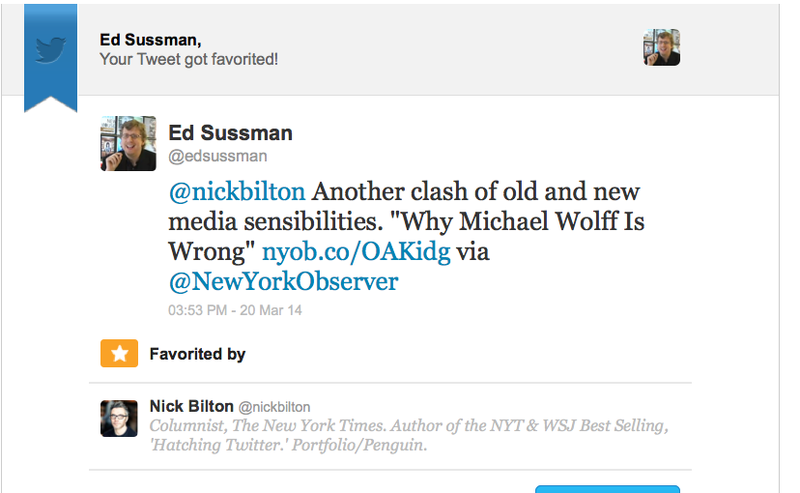 Created http://edsussman.org for my Ed Sussman Photographry Blog and http://edsussman.info for.. I’m not quite sure. Still testing. My trusty WordPress blogs continue: Publish or Perish by Ed Sussman at http://edsussman.com (for long pieces) and the one you’re reading, Ed Sussman Quick Links (for short pieces). In an unusual Facebook post(s fb), Mark Zuckerberg blasted President Obama on Thursday over controversial hacking tactics used by the NSA in the name of national security. The harsh words are likely related to leaked documents published yesterday that suggest the NSA has been instructing its computers to pose as Facebook servers in order to inject malware into people’s computers in order to spy on them. The leaks are the latest in a series of highly classified documents released by former NSA contractor Edward Snowden that have exposed how the NSA is using phone carriers and major tech companies to amass data and carry out espionage activities.